This page will features miscellaneous items that I haven't placed in any meaningful category and will include short news items and pictures. The Tretyakov is a national treasure of Russian Visual Art. The best of various periods and schools can be seen here, including works by Rublev, Repin and Surikov. It is famed for its collection of Soviet visual art, an example of which can be found above. 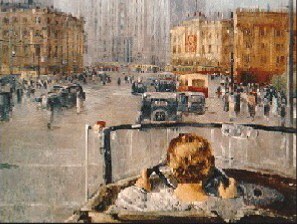 This painting shows a view of downtown Moscow from Teatralnaya (theatre street) to Okhotny Ryad (Hunter's Row). The grey building in the background is now the State Duma. 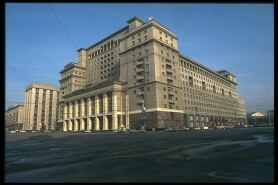 The State Duma can be seen just behind the building in the foreground which is the Moscow Hotel. This hotel, on Manege Square, was built in the thirties. Stalin approved two separate designs for the side blocks, the architects were not sure which design to use, so the hotel was constructed using both designs, thereby giving the hotel a clumsy, ill-proportioned facade.